My name is Yusra. Yes, I’m the girl who swam for her life, then swam at the Olympics. But I guess you’ve heard that story. It’s about my other name, my other identity. You see, my name is refugee. At least, that’s what they call me. Me and those 21 million others forced to flee persecution, war and violence. So, who is this refugee? Well, once I was just like you. I had a home, I had roots, I belonged. Like you, I lived my life day-by-day, caught up in my own hopes, passions and problems. Then war came and everything changed. War gave me a new name, a new role, a new identity: refugee. Suddenly it was go, drop everything, run for your life. Leave your home, relatives, friends and run. It was only after I crossed the border I realised I’d lost more than my house and all my possessions. I’d lost my nationality, my identity, my name. Now I was refugee. None of us could have prepared for that journey. The desperate prayers at sea, the long trek, the humiliation at the barbed wire. But however hard it was, we knew there was no way back. We’d already lost everything, there was no choice but to keep running, for shelter, for peace. And then, with a jolt, the journey ended. We were safe. Somewhere, in a tent, a camp, a shelter, the next stage began: the long wait. I think that’s when it hit us. We had nothing to do except cry for what we’d lost. Now we really knew what it meant to be refugees. So here we are, in a new life, none of us knowing how long we will live it. On average, we’ll spend twenty years in exile, never really belonging, just waiting for an end to the madness so we can go home. That’s half a lifetime, lost, nothing but strangers in a strange land. We struggle on with our lives. We fight to study, to work, to learn a new language, to integrate. All too often the barriers are too high, the odds stacked against us. But we know we must make the best of this strange and unexpected twist in our lives. To make the best of being a refugee. That’s our struggle. But this isn’t just our fight, it’s yours too. Many of you already know there’s so much more at stake. For my part, in the months to come I’ll be taking on a new role. I have an important message to spread. The refugees will not go away, there will be more of us. If humanity is to meet this challenge, you must know us for who we really are. Somewhere, some of you lost sight of that. When our deaths at sea became normal, our misery at the borders commonplace. We faded out of sight, were ushered away behind closed doors. At times, a truly horrific image forced you to face our suffering. A dead toddler lying face down in the sand on the beach, a child’s dazed and bloodied face in an ambulance. Yet afterwards, life went on. Many of you forgot us. Silence gave the other voices space to grow. From those who feared and hated us because we looked different, spoke differently, worshipped differently. Those who were most afraid shouted the loudest. They spread those old lies about us. They said we chose to come here, because we’re greedy, dangerous, criminals, here to threaten your way of life. Fear crept in and some of you began to doubt us. Before long, borders and barriers, both physical and emotional, sprang up everywhere. Refugee was becoming an insult, a name to hurt and humiliate. But there is no shame in being a refugee if we remember who we are. If we remember that being a refugee is not a choice. That our only choice was to die at home or risk death trying to escape. It was the choice between a bomb and drowning at sea. So, who are we? We are still the doctors, engineers, lawyers, teachers, students we were back at home. We are still the mothers and fathers, brothers and sisters. It was violence that made us orphans. It was war that made us terrified parents, sacrificing everything to save our children from carnage. It was persecution that drove us from our homes in search of peace. That is refugee. That is who I am. That is who we all are, that growing population of people without a country. This is my call for us all to take a stand now, together, under that name we share, refugee. I am Yusra. I am a refugee and I’m proud to stand for peace, for decency and dignity for all those fleeing violence. Join me. Stand with us. 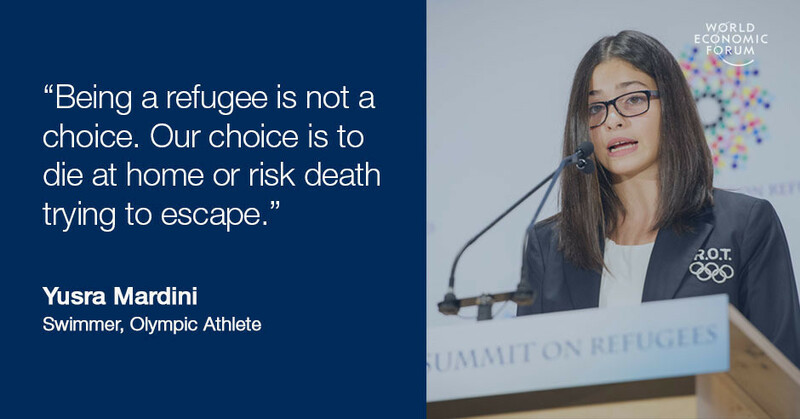 Yusra Mardini is a High Profile Supporter for the UN Refugee Agency (UNHCR).